We’re running a series of blog posts highlighting WaterAfrica friends and the reasons they participate in our annual Walk4Water. Please join the families with young children, the college students who give us their time and talent, the local student athletes and leaders, the adults who want to know more about life outside the cul-de-sac, the Mayor, and our corporate sponsors as we discover what it’s like to walk for a mile carrying a heavy bucket of water – dirty water – for our family’s daily use. Come and meet our special guest, Fred Mazumba from World vision Zambia. Ask him what’s possible in a rural village with gained access to clean water and improved sanitation. When I travel to Zambia this July, I’ll share the story of how you came, and how you cared, with the World Vision staff and the people of Hamaundu. And we’ll celebrate that all of our lives grew larger in the process. Thank you for your faithful support. Come and Walk4Water with us. Why do You walk? We’d love to hear your stories. Please share them in the comments or email jsearls@waterafrica.org if you’d be willing to have us feature your story in future posts. 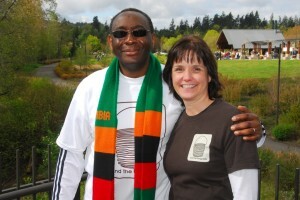 I (Sheri) first traveled to Zambia in 2004. Being a nurse I was keenly interested in the HIV/AIDS epidemic and yearned for these people to be free of the pain, loss of family and stigma. Finally understanding how HIV is transmitted in this region sort of turns on a light bulb making the whole picture of this tragedy come into clear focus. I visited the Mother Theresa hospice and saw the faces – the haunting eyes and the skin barely covering bones on men and women perhaps just hours from death. Within a short distance were other families waiting to bring their loved ones to refill those beds. Two rooms over were the babies and children. It was heart wrenching. These are faces I can’t forget. In 2008 Bob and I both returned. No longer were the hospice beds full of people near death, instead the people were in the solarium waiting to sing songs for us. The children sang and brought us flowers. This is what the anti-retroviral vaccines accomplished in 4 short years. I was ecstatic. But…I know how many dear ones still fear the next blood test and families are not yet whole. A significant component to improving health is fresh clean water. Our family decided that funding a well was something tangible we could do to help stop some of the “hurting”. For us this was a step in faith, hoping clean water would not only be a small demonstration of our love for these people now, but would also be sustainable for years to come. 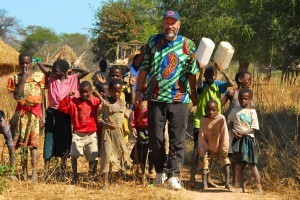 On the 2008 visit Bob walked with the women to dip their water from dirty mud holes. “Are you going to boil it,” he asked? No. They didn’t have the time nor the energy. Yet on the same trip we also saw new boreholes and we knew that many people were now able to draw clean water for their better overall health. While there we were able to see the drilling of “our well” hit water. That was a thrill that we’ll never forget. We sell cards because the photos we took represent real people. Many are just faces. Beautiful faces. These are the people on the bags and cards. They won’t ever let us forget them. Most are happy despite their situation. Some pictures are of the villagers walking with buckets, some are of boreholes, and our favorite are the children pumping fresh water from their own wells. We can envision villagers splashing in clean fresh water from “our” well and pray that soon this will be representative of the daily life in all villages. Some photos are from our safari visit. These represent what many people think of when they think of Africa. They remind us of the beauty of nature and that there are still places where these animals roam free. Add those to the “people” of Africa and it gives us a more complete picture of the whole of this country. Simply, these photos won’t ever let us forget the people of Zambia and we want to share our experience. Perhaps some may be inspired to visit there, some nudged to donate, or some to just ask questions. We love to tell the story! ****Bob and Sheri will be at Walk4Water5 with cards and bags for sale. 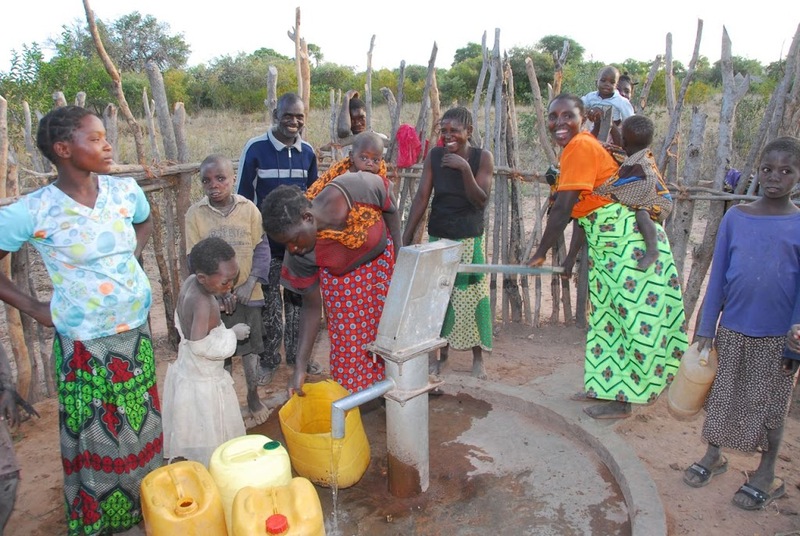 100% of your purchase price is given to World Vision’s Water, Sanitation & Hygiene projects in Zambia (ZWASH). WaterAfrica’s annual Walk4Water relies on the remarkable support of our local communities. 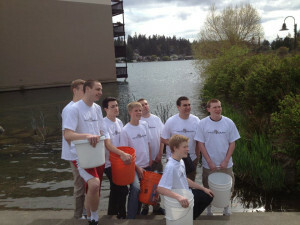 For the second year in a row, administration and staff at Lake Oswego Junior High included WaterAfrica in their Community Service Day events. Last Friday, longtime Walk4Water supporter & LOJ secretary, Lisa Oliva facilitated a water bottle/garbage can project with students that was both educational and useful – please WATCH for their product at Walk4Water5! We look forward to having LOJ students and others others from various schools and grade levels walk with us Saturday! Please thank and encourage these youth in their Walk4Water involvement. They are on their way to becoming global, caring citizens and leaders. We are grateful for the time and energy they invest in our efforts to End the Long Walk. Over on WaterAfrica’s Facebook page we’ve had fun looking back at Walk4Water pictures. Now here’s a look back at our video reports…. 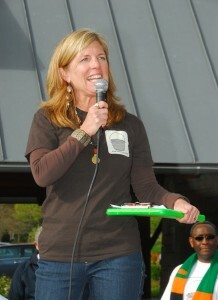 We don’t have a video from Walk4Water1, but the Walk raised $6,000 and had 150 participants. 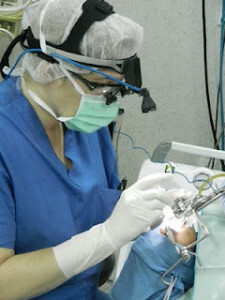 You can see pictures on facebook. Walk4Water2 raised $12,000 with 200 participants. Our Walk4Water5 goal is $50,000! Donate – 100% of your registration and donations are given to World Vision’s Water, Sanitation & Hygiene programs in Zambia (ZWASH). Thank you for your help. It’s life-changing. I first learned of WaterAfrica’s work at a Lake Grove Presbyterian Church mission fair. I was thunderstruck by the great need contrasted with the simple amount of $35 to provide one person with a lifetime supply of clean water. I retired in 2005 from a counseling practice and I knew that when the family need for my time diminished I wanted to find meaningful volunteer work. Providing clean water to transform the quality of life for a village, especially for the women and girls, seemed so worthy. I invited Bill and Diane to speak in our home to a small group of our friends. 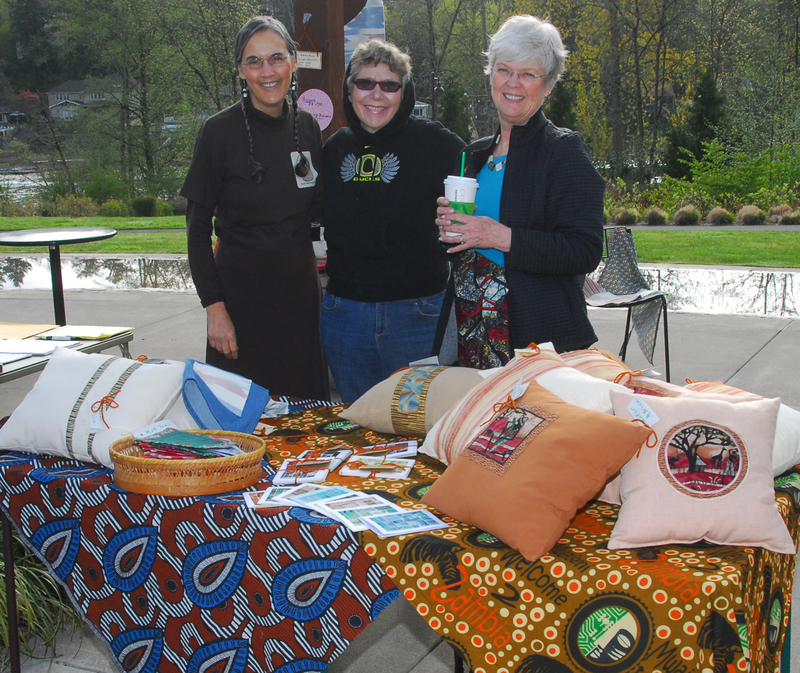 At that time I asked if they would ever consider selling things I make with all proceeds benefiting WaterAfrica. I was nervous about proposing this, thinking it wasn’t something they would want to do, but in fact they took the question to the board where the idea was well received. 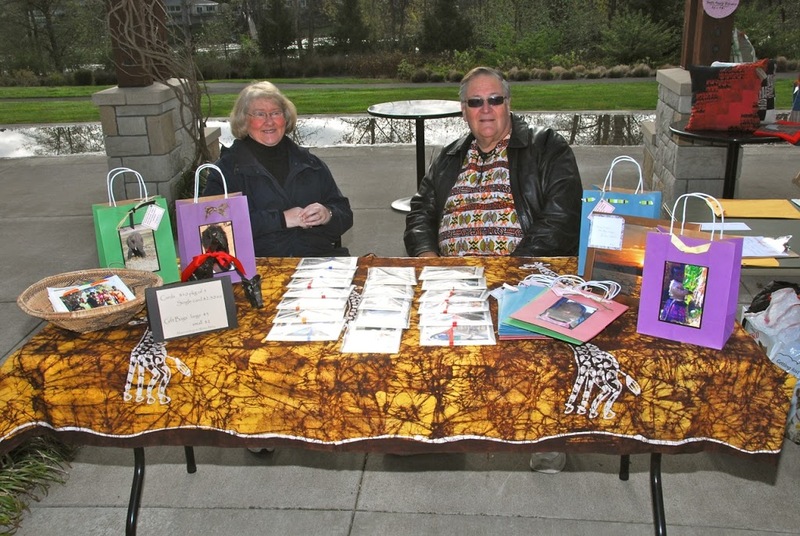 From that moment I have had great, great joy in making all sorts of things to sell at various events. So many others have been supportive – donating fabric, encouraging me, and buying my wares! I am so grateful for my husband Steve’s unwavering support for my work on this project. As I work on each item I feel the presence of the women and girls across all those miles, and think of how far they must be walking that day while I’m making something I hope will lift their burden. One of my favorite hymns speaks of holy hands and in some small way I feel God’s spirit moving my hands, and what a blessing that is. 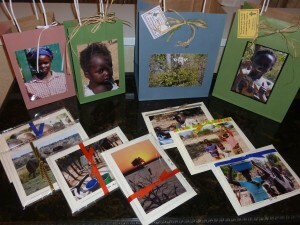 ****Claire will be at Walk4Water5 with many new items for sale. 100% of your purchase price is given to World Vision’s Water, Sanitation & Hygiene projects in Zambia (ZWASH). $50 provides clean Water + Sanitation & Hygiene for one person for the rest of his or her life. Why do You walk? We’d love to hear your stories. Please share them in the comments or email jsearls@waterafrica.org if you’d be willing to let us feature your story in future posts. We’re running a series of blog posts highlighting WaterAfrica friends and the reasons why they participate in our annual Walk4Water. 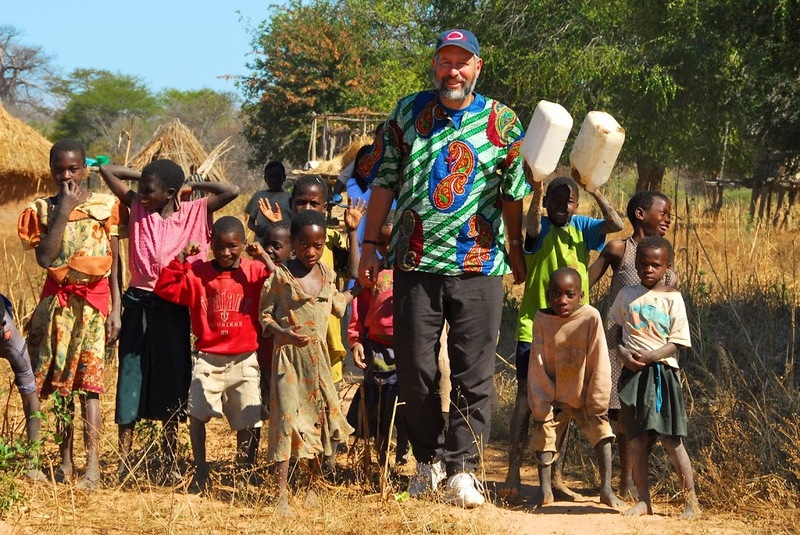 I am participating in WaterAfrica’s fifth annual Walk4Water event on April 28th because I have seen firsthand what a difference clean water and proper sanitation can make in the lives of people living in Zambia. In 2007 I travelled to Zambia and what I saw alarmed me. In many of the villages I visited, clean water was not available and there were no latrines. Women and children walked great distances several times a day to polluted water sources in order to gather their family’s supply of water. In one village I found women collecting water from a creek downstream from where people were bathing and tending their pigs. In another village children led me to their water source, a hand dug shallow well. As a young boy scampered down into the well he began filling his bucket with dark brown water that made my stomach turn. The water these villagers have to drink is not safe. In Zambia, one in nine children will not live to the age of five and polluted drinking water along with insufficient sanitation is the primary cause. Other villages I visited had clean-water boreholes and latrines. The difference these measures make is remarkable. By providing safe drinking water and proper sanitation, child mortality is cut in half, girls have time to attend school, and mothers can nurture their families and tend kitchen gardens. 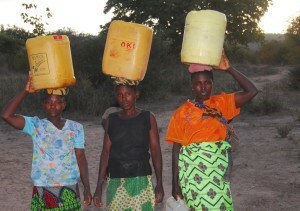 WaterAfrica is working hard to provide safe drinking water and proper sanitation in rural Zambia. Walk4Water is our primary fund-raiser for the year and I hope you will join us at Foothills Park in Lake Oswego on Saturday, April 28th, at 8:30 a.m.
Walk4Water5: Our Teens Take the Lead! 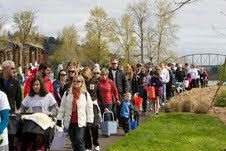 We are grateful for the wonderful Walk4Water support we have in Lake Oswego and surrounding communities. This morning the Lake Oswego Review published an excellent story by Cliff Newell about Walk4Water5 and the extensive, varied youth involvement you can expect to find on April 28. 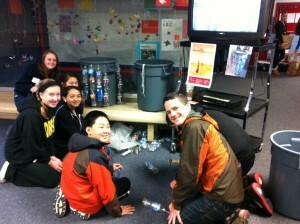 You can read about the “New generation of water scoopers” and more….here: Teens to Power Walk4Water5 on April 28. Follow the lead of our teens! Invite your friends. We look forward to seeing you April 28! Today’s story links to an article by Matt Cooper in the mid-April issue of Inside Oregon, an internal publication for University of Oregon faculty, staff and graduate teaching fellows. In rural Zambia, women and children walk six to eight hours every day for a bucket of water. The water, which comes from a mud hole, is typically the color of tea with milk. There is the constant concern that cows and other animals will drink from it and leave it contaminated with dung. 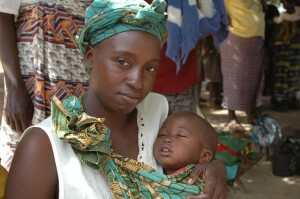 Dehydration from diarrhea is a fatal threat to the children. When Linda Favero saw the situation firsthand for the first time in 2008, the bells went off. My wife and I are walking because of Kyra. Kyra, our first grandchild, died just before she was born. I can’t describe the grief we felt…or the much deeper grief Kyra’s mother and father felt. Her death and the grief it sparked motivated us to do all we can to keep other parents from feeling that grief and to enable other children to grow and flourish. We focused on an area where there is a lot of childhood mortality and a lot of grief—rural Zambia. We found that providing safe water and sanitation cut childhood mortality in half. As a result, half as many parents grieve; twice as many children grow and flourish. This picture inspires us on our “Kyra mission,” to help keep the baby alive and keep the mother from grieving. We’re walking because of Kyra. Why Do You Walk? We’d love to hear your stories. Please share them in the comments or email jsearls@waterafrica.org.